Michael's Mansion is a unique all-inclusive wedding ceremony and reception location as well as an elegant Bed & Breakfast. 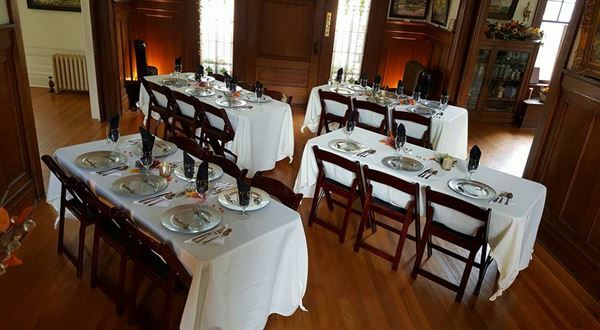 Michael's Mansion offers a beautiful venue for weddings and other special events for up to 60 guests inside and up to 300 outside on the Mansion grounds. Once a private estate, Michael's Mansion is an authentic three-story Neo-Classical home, listed on the National Register of Historic Places. The Mansion boasts stain-glass windows, exquisite quarter sawn oak woodwork and a grand staircase. It is a beautiful venue for weddings, events and parties. In the heart of Fort Smith, Arkansas, near the historic downtown. Michael's Mansion is a historical home that was built in 1904 by Horace Franklin Rogers. Our staff will work within your budget to create your custom wedding or choose from one of our Wedding Packages below. Just the Two of Us | $325 - $375 • One Hour at the Beautifully Decorated Mansion • Minister & Standard Vows • Wedding Coordinator • Ceremony Music • Bouquet & Bontonniere • Cake & Sparkling Cider Toasting for Two • Guests are $25 each (max. 8) Intimate Beginnings | $975 - $1,075 • 30 Minute Rehearsal • 30 Minutes in Bridal Suite • Two Hour Ceremony & Reception at the Beautifully Decorated Mansion • Minister & Personalized Vows • Wedding Coordinator • Bouquet & Boutinniere for Bride & Groom and One Attendant each • Tables, Chairs, Linens, Color Coordinated House Centerpieces • Wedding Cake, Punch, Nuts & Mints • Use of Cake Stand, Knife, Server & Toasting Flutes • Cost is for Bride, Groom & 8 Guests. Additional Guests are $30 per person (max 10) Simply Elegant | $1,475 - 1,595 • 30 Minute Rehearsal • Two Hour Ceremony & Reception • 30 Minutes in Bridal Suite • Minister & Personalized Vows • Wedding Coordinator • Custom Bouquets for Bride & Maid of Honor • Custom Boutinnieres for Groom & Best Man • Wedding Cake, Punch, Nuts & Mints • Tables, Chairs, Linens, Color Coordinated House Centerpieces • Use of Cake Stand, Knife, Server & Toasting Flutes • Cost is for Bride, Groom, & Up to 23 Guests. Additional Guests are $30 per person (max 10) Grand Affair | $2,325 - 2,675 • 60 Minute Rehearsal • 60 Minutes in Bridal Suite • Two Hour Ceremony & Reception • Minister & Personalized Vows • Wedding Coordinator • Bouquet & Boutinnieres • Two Attendants Each • Wedding Cake, Punch, Nuts & Mints • Tables, Chairs, Linens, Color Coordinated House Centerpieces • Use of Cake Stand, Knife, Server & Toasting Flutes • Parking Attendant • Cost is for Bride, Groom, and 38 Guests. Additional Guests are $45 per person (max 10) The Wedding of Your Dreams | Contact us for Price • Our Certified Wedding Coordinator will work with you to create the wedding of your dreams! She can help you create anything from a private intimates ceremony to the grandest event host in the Fort Smith River Valley. Our award winning chef will work with you to create your personalized menu.